The Rivers Casino in Pittsburgh, situated along the Ohio River, is the city's first casino and is built on a 13-acre former brownfield site. It is adjacent to the Carnegie Science Center and within easy walking distance to Heinz Field (home of the Pittsburgh Steelers football franchise) and PNC Park (home of the Pittsburgh Pirates baseball franchise). 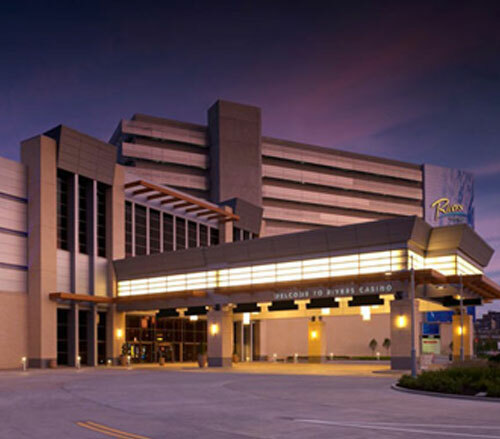 Las Vegas based Bergman Walls & Associates was the architect of record and design on the Rivers Casino project in collaboration with Pittsburgh-based architecture and planning firm, Strada Architecture LLC, for the exterior architecture. Barden Development and its subsidiary Majestic Star Casinos retained Bergman Walls & Associates in 2005. The firm worked with PITG Gaming, a subsidiary of Barden Development and the Pennsylvania Gaming Control Board. In 2008, the project changed ownership to Holdings Acquisition Company L.P. Bergman Walls & Associates continued as architect of record and design on the project. 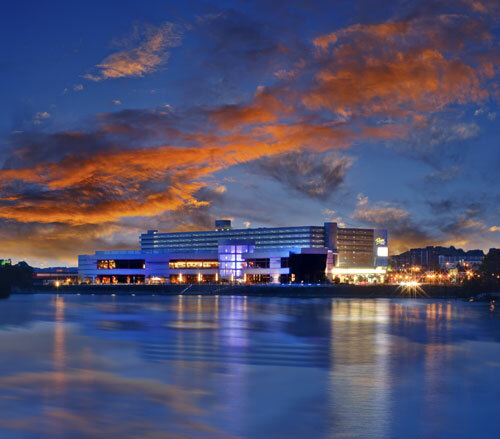 The casino faces the waterfront and opens up to a riverfront park and promenade that extends beyond the casino. A riverfront trail passes directly in front of the casino connecting to each stadium. 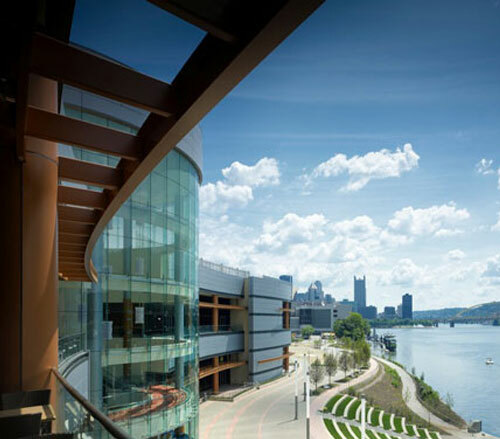 Rivers Casino has views of the Pittsburgh skyline and the confluence of Pittsburgh's three rivers. The design embraces Pittsburgh's manufacturing heritage by including steel, aluminum and glass. The slot machines are fed through the floor via an under floor duct system supplied by HH Robertson/Centria. Each slot bank is serviced by 120 volt power, 1-6 strand fiber, and 2-Cat 6 cables. Emergency power is provided by 3-2 Meg 4,160 volt Caterpillar generators feeding an ISO/Eaton paralleling gear line up. 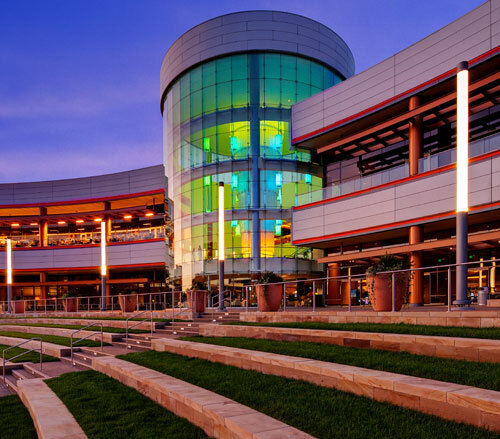 Cathode Systems of America worked with Illuminating Concepts to specify the cold cathode used on this project. The project consisted of approximately 6,500 linear feet of 15mm cold cathode lighting in 2,800 degree Kelvin Tri-phosphor white. The glass was processed on Eurocom equipment with tubomolecular pump and gas filled with pure Argon to guarantee cool operation and long life.The system operates on 5,000 to 9,000v X 120ma transformers. The installation was by Lighthouse Electric electricians with supervision by Robert Costa and Shamrock Signs. 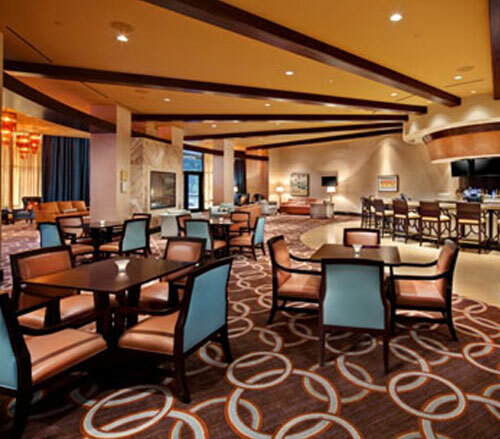 The large circular chandeliers on the casino floor are designed and built by Lusive Decor from Los Angeles, California. Each fixture contains around forty incandescent lamps at various wattages. These fixtures also have a revolving mirror ball for a subtle effect. There is over 5,000 feet of Bruck Orion Belt LED illuminating the ceramic tile on the Casino floor. 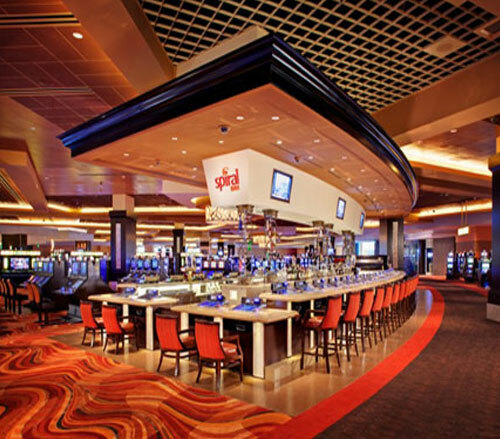 There is 6,000' of J&J Electronics CoveBright accenting the casework throughout the Casino. The Levels Bar is surrounded with this product along with the coves in the restrooms. On the foot rest at the Drum Bar, the Tokistar Advantage Xenon Cove Light at 2300K illuminates the plexiglass. 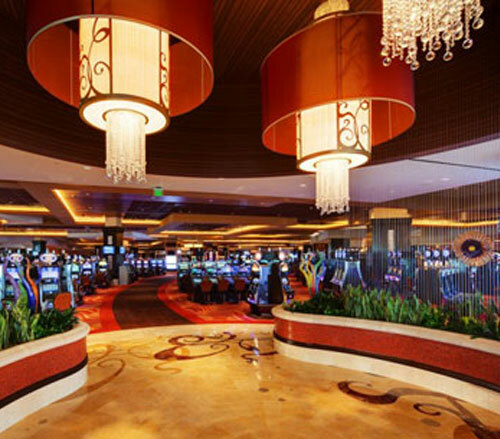 Over 1,100 75 watt halogen lamps provide the lighting for the Casino floor installed in a Zumbtobel fixture. The drum feature itself is comprised of two main components; the “Core” is the centrally located shaft made of a series of vertically oriented square metal tubes that contain RGB LED pixels. The pixels are spaced in a density that allows graphical imagery and colored patterns to be broadcast across its entire height. The color tubes are cylindrical pendants that suspend from the ceiling of the room and surround the core element. The pendants contain color changing lighting that allows the entire length of the tube to change color that compliments the graphical imagery being displayed on the core. Electric Construction Duration was 18 months from start to finish with a 2 month work stoppage while owner financing was obtained.